Congratulations – you’re human. We all make mistakes, and “pigging out” while on a diet is not a failure. It’s just a slip-up, a temporary setback you can overcome. All is not lost. 1. Plan the rest of your day accordingly. Do NOT skip meals, but have a lighter dinner (and lunch, too, if you haven’t eaten lunch yet). A bowl of cereal and skim milk works well for a light meal (measure your portion so you’re not having hundreds of extra calories), as does a container of low- or no-fat yogurt with fruit, a big salad, a baked potato with broccoli, or even a sandwich on whole-grain bread. 2. Fit in an extra 20 to 30 minutes of exercise today and tomorrow. This will give you a head start as you’re getting back on track. 3. Think about what may have gone wrong. Did you let yourself get too hungry? Were you eating to fill an emotional need? Was the #food sitting right in front of you, tempting you even though you weren’t hungry? The more you learn about your behaviors and WHY you slip up, the better you can prevent them. Also, keep in mind that if you have frequent “pig outs” there is probably something about your diet plan that you need to adjust. Dietary consistency, not taking breaks or needing the occasional pig out, is important for long-term success. Evaluate, and ask yourself if your diet is too restrictive. If so, make the necessary adjustments. It’s been one of those weeks, hasn’t it? Everyone’s been getting on your nerves, you have a hundred things you need to take care of and it just doesn’t seem like there are enough hours in the day – I can relate. Step 1: Become aware of your breathing. Sit or lie down in a quiet room with your hand placed on your abdomen. Step 2: As you inhale, your belly should expand slightly on its own. Try to relax your abdominal muscles — you’ll get the most effective breathing from a relaxed abdomen. If possible, inhale and exhale through your nose only. Step 3: The hand resting on your abdomen should rise with your belly as you inhale and fall as you exhale. Make Notes. Get out your notepad and get organized. Prioritize. Make a list of what you need to do. Writing everything down will allow you to be more efficient with your time and resources. Plus, you’ll feel great when you can cross something off the list after it’s done. When you’re feeling stressed or anxious, instead of eating, call a friend and vent. Listen to some relaxing music. Get some physical activity. Exercise causes your body to release endorphins, which can give you the feeling of a “natural high.” Laugh more by renting a few funny movies or even a TV series you’ve never seen. Get more sleep – research shows that sleep keeps weight off and reduces disease. Many people struggle with this. First of all, don’t be a Diet Hero – keep unhealthy foods out of the house. Don’t tempt yourself. Focus on eating more slowly so that you become more aware of your body’s hunger and satiety. Allow at least 20 minutes for your brain to receive the message that your stomach is full. Also, eating slowly allows you to appreciate your food more. 1. Brush your teeth. I know this might sound ridiculous to some, but it can work as a reminder that eating is over and give you a sense of completion. Also, you might not want to give up that fresh-brushed feeling by eating junkie food. 2. Drink a big glass of water or have a cup of green tea. Drinking fluids can help fill you up. Also, many times we mistake thirst for hunger. This will help you determine if you’re really hungry. 3. Eat large quantities of steamed green veggies with salt, pepper and fresh garlic. Nothing like a nice dose of low-calorie, high-nutrient vegetables. 4. Throw the food away. Sometimes just tossing the food helps. I realize that this can be a waste of food, but drastic times sometimes call for drastic measures. – Use a smaller plate. As simple as this sounds, it works. 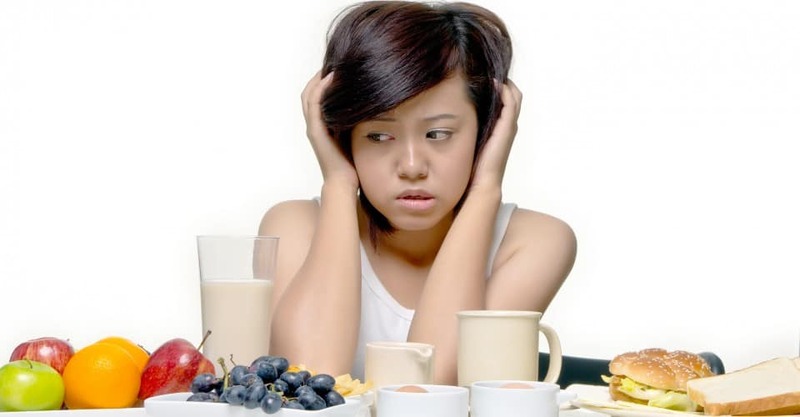 Studies have shown that people eat more when there’s more on their plates, regardless of how hungry they feel. So put less on your plate, but trick your eyes into thinking you’re eating more by using a smaller plate so that it looks full. – Never eat directly out of the container, bag or box. It’s hard to keep track of how much you are eating when you’re just reaching in and stuffing the food into your mouth. Before you know it, the bag is empty. Instead, use a measuring cup and/or scale, and measure your cereal into a bowl, your rice onto your plate, your tuna salad, your potato chips, your strawberries … everything. Put away the rest, and only THEN sit down to eat. – Pre-portion. Use baggies or reusable plastic containers and measure out a healthy portion of foods in advance so that you have them ready to go when you want or need them.